Home / As The Quilting Goes!! In August 2012 some months after losing my beloved Tim it was time I thought, to come out of that black hole and try to get back to my sewing again. It was suggested that a trip to the Festival of Quilts would be therapeutic and would perhaps inspire me again. On the way Maggie Howell asked if I saw some fabric with bottles on, to note where it was. I asked why and she said she needed it for the challenge – “Which challenge was that said I?” “‘As the Saying Goes’ for the Westpoint Show” she replied. Well, having been in another world for three months, what was I going to do? All the way up to Birmingham and all that night I was, in my mind, going through all the sayings I could muster – and didn’t sleep much that night either. I put it to the back of my mind during the show until the final minutes of the last day. As I was walking out to the bus, Fabrics Galore had a stand close to the door and there it was – my challenge quilt suddenly came to me in the shape of a metre of cow fabric. Within a week of returning home I had that quilt designed, bonded and all ready to stitch. It was ready for the challenge way ahead of time. Jean Bartlett was back in the land of quilting once more which made that quilt very special to me. My little French granddaughter who lives on a dairy farm and loves the cows loved that quilt too, so I promised to send it from Pere Noel (French Father Christmas) for her, but first it had to go to the quilt show in March which it duly did and received a second prize rosette. It also went on Facebook where it was seen by Ben who contacted the contact us page on SWQ website. Ben to SWQ: “My wife and I are expecting our first baby in June. 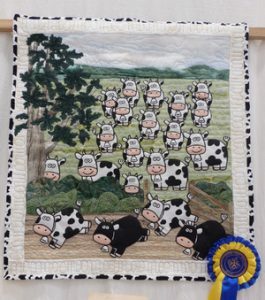 After a friend visited the Exeter Quilt Festival my wife saw a picture of a prizewinner ‘Till the Cows Come Home’ by Jean Bartlett. Jill must have spoken to me because she sent Ben a message saying she has never done a repeat quilt, that one is for her granddaughter. She is asking when you would need it and she would not know what to charge if she did it. Just before Christmas and after checking that I had enough of the appropriate fabrics, I actually phoned Ben for what I thought was going to be a difficult conversation – it was not. I agreed to make the quilt, a price (which he thought was high, but then he would not know how long these things take) and a completion date of the end of April. I had it like its predecessor bonded, bordered and ready to stitch – then came Christmas. January came and went as did February, March and April. By the middle of May I thought I should get on with it – I was quite right, a second quilt is not easy. That being said on May 30th in the afternoon. I put the finishing touches when I had a phone call – it was Ben. He did send a cheque, after all he is a Police Officer from Oxford, together with the loveliest thank you letter from Jemma. The nursery is decorated with a farm animal theme which makes “Till the Cows Come Home Number Two” just perfect.